Even in the moderate Dutch climate in summer we have days that are so warm that it is nicer to cook outside than inside. What is locally called “barbecue” is usually a festive meal where everyone participates in the cooking process. This involves mostly cheap meat that ends up burnt on the outside and undercooked on the inside (or burnt and overcooked because people put stuff on the grill and then walk away). Of course the same grill can also be used to cook a plated meal, and that is what I did here based on something that Teun prepared. 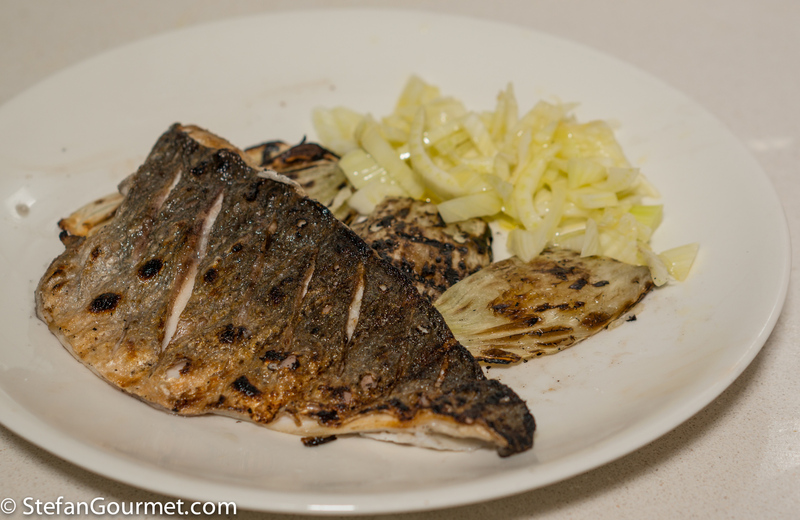 Both the sea bream and the fennel are cooked on the grill. I liked Teun’s rendition better than my own because he used more moderate heat with a cast iron grate that produces nice ‘grill marks’ on the food and delivers better heat distribution (less radiant direct heat from the coals and more indirect heat from the hot iron). So I guess it is time to invest in a cast iron grate. But the main issue with my rendition was that the fire was too hot and I was too hungry to wait for it to diminish to more moderate heat (and my grill did not allow to increase the distance between the charcoal and the grate any further). I did manage to cook the inside before the outside was burnt, but only barely. And my thin grate hardly produced grill marks. As with all simple recipes, the success of this dish is determined by the quality of the ingredients and the skill of the chef to cook them just right. Start by cleaning and oiling the grate. Build a charcoal fire (or preheat the gas grill) using half of the space, so there is room on the grate to put food away from direct heat. 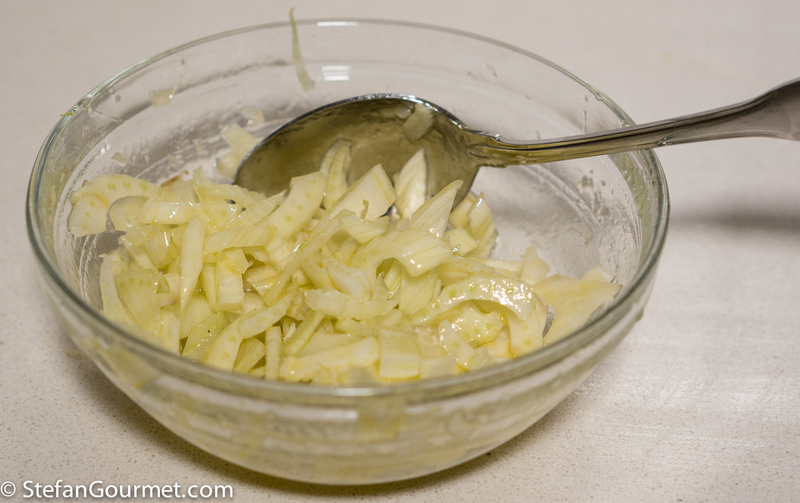 Cut the fennel into quarters, remove the core, and break into ‘leaves’. Trim away any thin edges and set them aside with any inner thin ‘leaves’, so you end up with some thick ‘leaves’ that have mostly an even thickness. (The thin edges will burn if you don’t trim them.) Save the fennel fronds for garnish, if you like (which I forgot). Brush the thick pieces of fennel with olive oil on both sides. 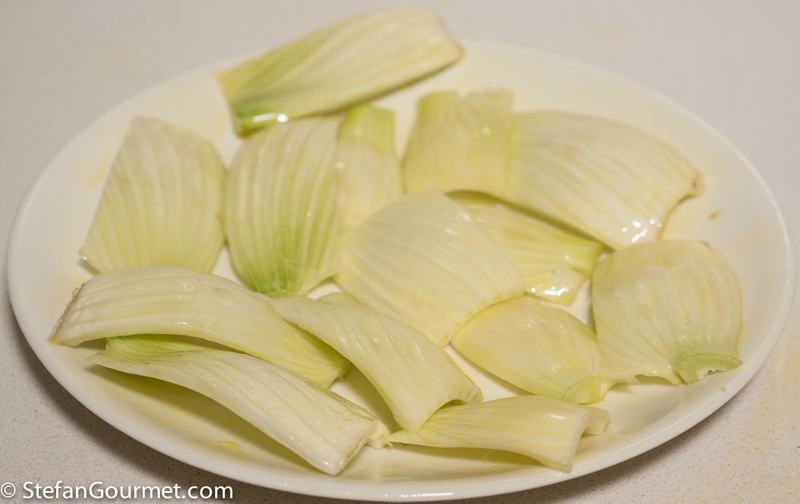 Slice the thin pieces of fennel thinly, and dress with salt and extra virgin olive oil. 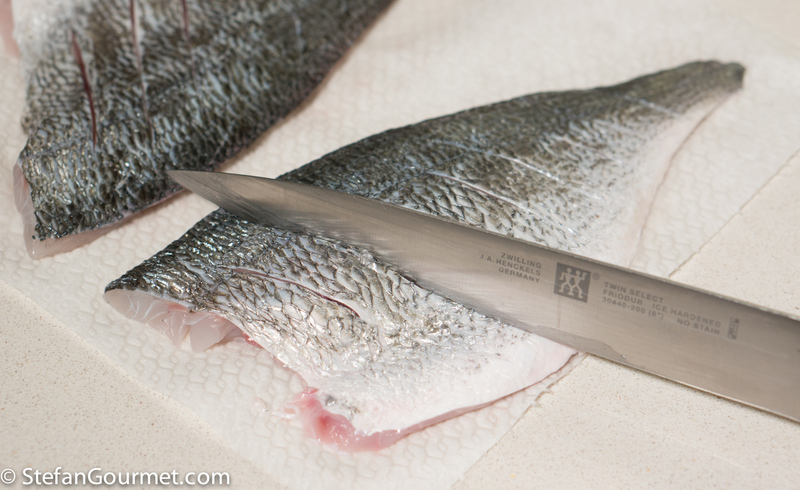 Make cuts in the skin side of the fish, about 1.5 cm (1/2 inch) apart, cutting into the flesh but not all the way through. 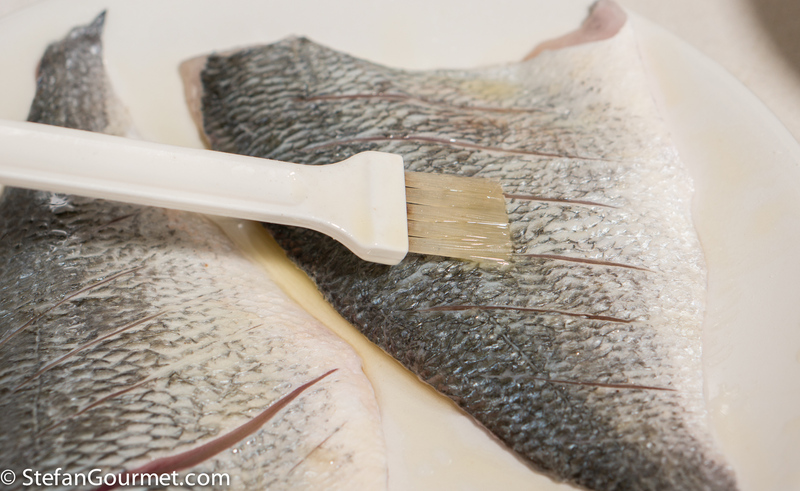 This will prevent the skin from curling when you grill the fish. Season the flesh side with salt and freshly ground black pepper. Melt some butter, preferably clarified. 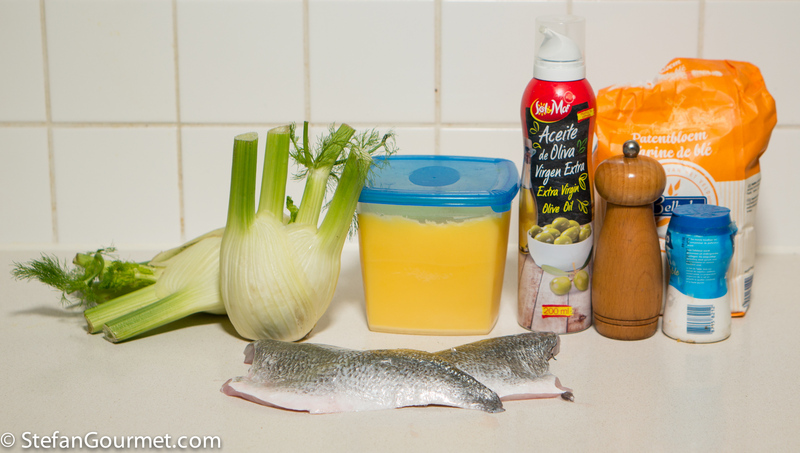 I’ve found it works better than oil for crisping up the skin of the fish. 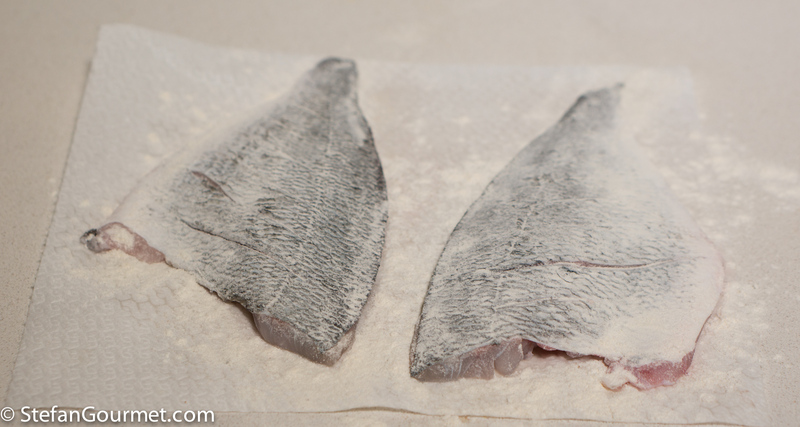 Dust the skin side of the fish with flour, shaking off any excess. 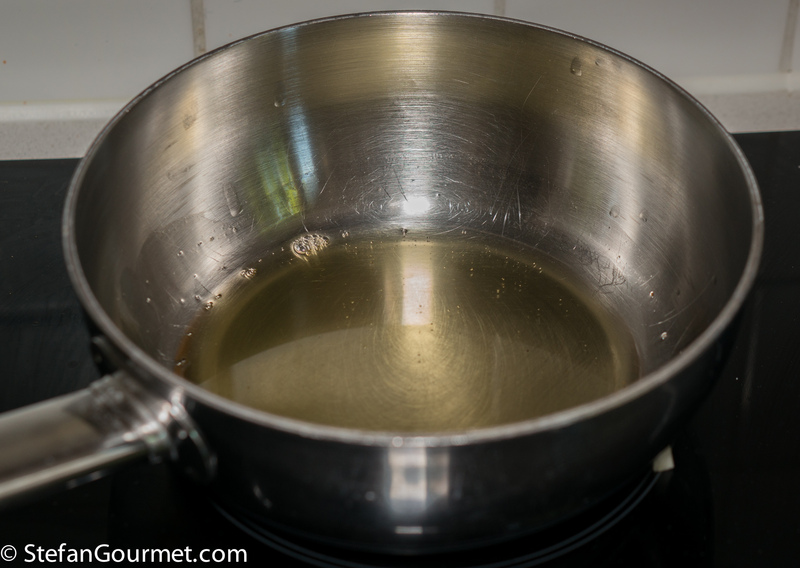 Brush the floured skin with the melted butter. 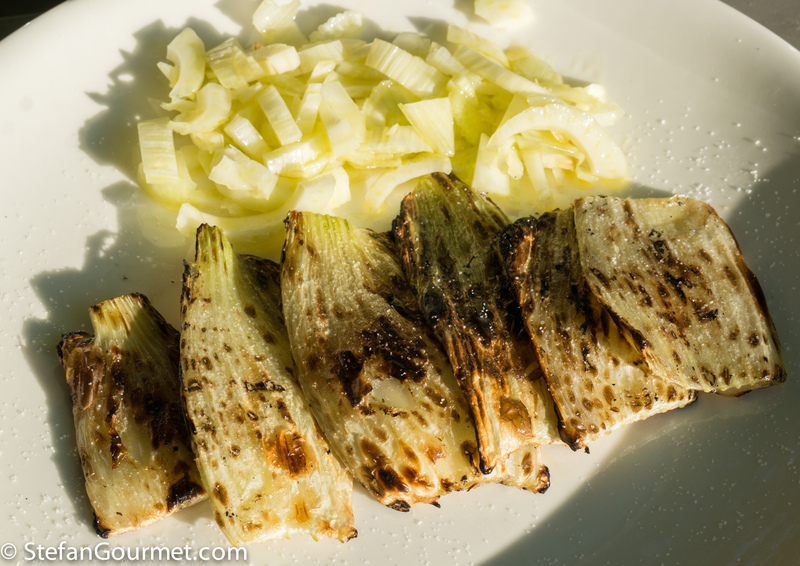 Start grilling the fennel, turning them frequently, until tender but firm to the bite with some nice grill marks. When they are almost cooked, move them away to the side away from the charcoal. 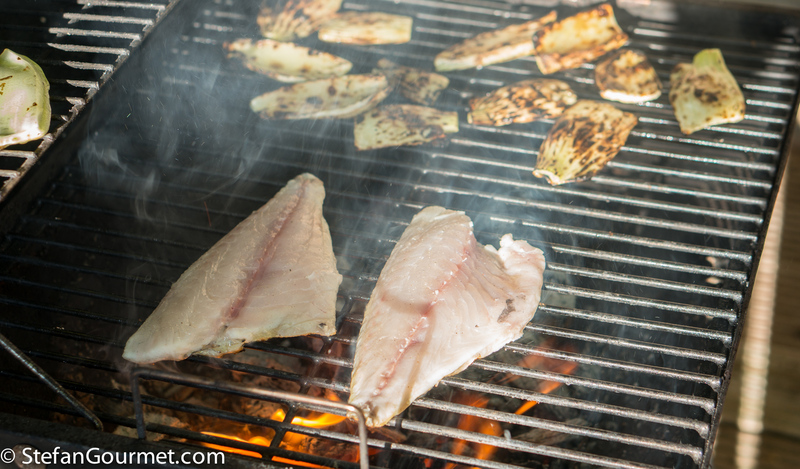 Put the fish directly over the charcoal with the skin side down. Do not move the fish until it turns white on top. 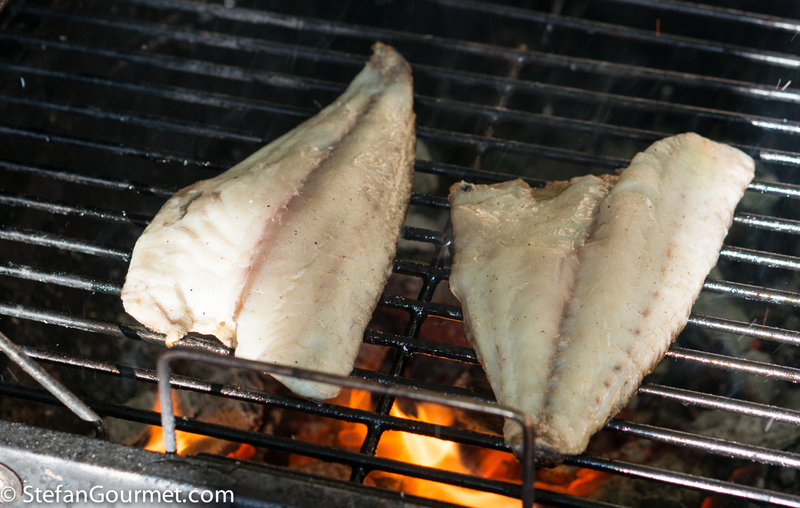 If you used the right amount of heat, the skin will be crispy with nice grill marks at the same time. If the heat is too high, the skin will burn before the flesh is cooked. If the heat is too low, the flesh will be overcooked before the skin is crispy. This will take some practice, but is easier if you can control the amount of heat (which is much easier with a gas grill, but at the expense of not getting the flavor imbued by using charcoal) and if you use a cast iron grate. Prepare plates with the fennel salad and grilled fennel while the fish is cooking, and season the grilled fennel with salt (and drizzle with extra virgin olive oil, if you like). When the fish is cooked, plate it with the fennel, skin side up, garnish with fennel fronds (which I forgot), and serve at once. This is great with a godello from Valdeorras in Spain, but many other dry whites will also work, like an arneis from Piemonte in Italy. An appropriate flashback for another recipe for grilling: grilled marinated jumbo shrimp. You are so right. Most people’s barbecued meat is burnt on the outside, and overcooked on the inside. It’s horrible. I would be happier with undercooked I think! 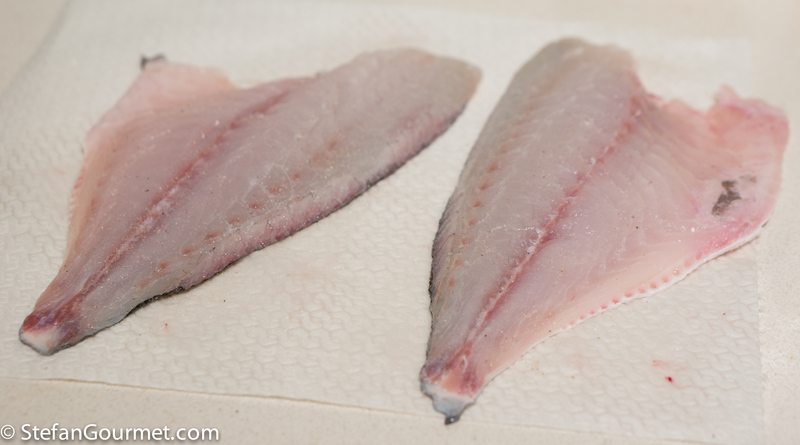 Your bream looks perfect! Looks delicious. I never thought to grill fennel. I bet that’s yummy. Ricetta deliziosa come sempre.I finocchi grigliati non li ho mai provati. Devo rimediare subito.